Sherie came down with the respiratory flu last weekend. She had been dragging, and by Saturday she was hoarse, spacey, and tired. A bit feverish as well. So plans interrupted again. (Well, we were supposed to lead a Grizzly Peak Cyclists ride, but it rained to bail us out of that without trying to do it while sick.) It took Ben until Monday to feel it, and he never got as sick as Sherie did. (Ben had a flu shot this year, Sherie didn’t, whatever that may be worth.) We both ended up missing a couple days work to stay home and nap, and dragged our tired butts into the office later in the week. Needless to say we did very minimal workouts this week, and each only rode the bike to work once. Now, it has finally been getting warmer. Today, probably seventies at the house, after cool nights near forty. And after walking to do our errands, Ben suggested an easy bike ride by the bay. So we took our commute bikes up the hump on Solano and to the Bay Trail. Pic doesn't show it, but thats a 12% grade going down toward the bay! We had an easy cruise on the MUT (Multiple Use Trail) Bay Trail. (Like many places around here, the bushes could be trimmed to keep the trail full width for all the various users at various speeds with various contraptions and various pets.) Nice to be in the sun, shirt sleeves to sit on a bench and looks at the bridges and city. The new Bay Bridge span really shows from the Marina; the tower is very tall above Treasure Island. After stopping at Sea Breeze for a shared clam chowder, crab sandwich, and carrot salad, we were soon home. Perhaps in a few days we can get back to our workout schedule. For now, we just need to let the bodies slowly come back to speed after the flu. 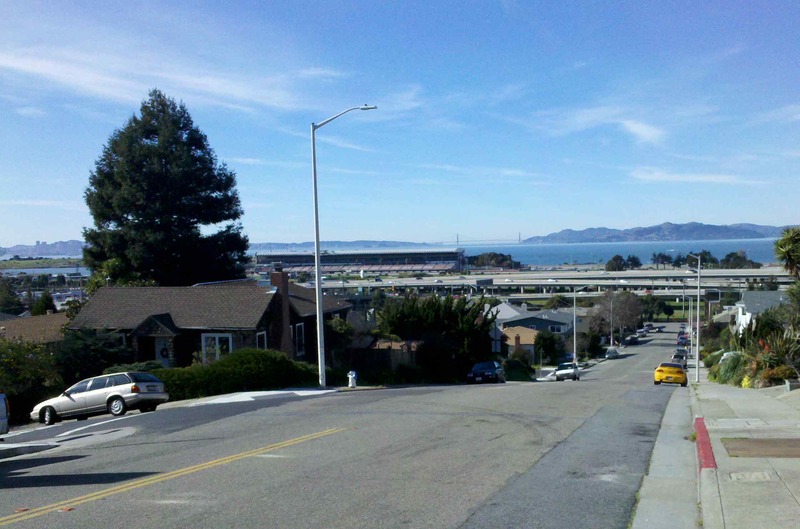 This entry was posted in Cycling, Grizzly Peak Cyclists, Uncategorized. Bookmark the permalink.